The Fuji Five Lakes area is found at the northern base of Mount Fuji around Lakes Kawaguchiko, Saiko, Yamanakako, Shojiko and Motosuko. It is one of the best places to see fabulous views of Mount Fuji from a close distance and also a good base for those wishing to climb the mountain. Hiking, camping, fishing and other sports are among the popular outdoor activities that can be enjoyed in the area. 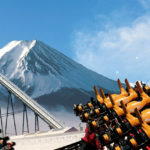 There are also many hot springs and museums found nearby, along with Fuji Q Highland, one of Japan’s most popular amusement parks, which has some of the best roller coasters in the world. Among the lakes, Lake Kawaguchiko is the easiest to access and offers the most things to see and do for most foreign travelers. The four other lakes are less developed than Lake Kawaguchiko and are not as easy to access by public transport.